Tuesdays with Uncle Athanasius: Why did Jesus Die Publicly? 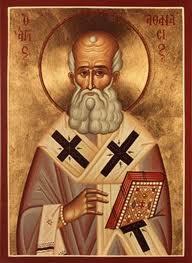 Athanasius, my favorite early church father, fought heretics with all of his soul. I am brought to tears reading his glorious writings. 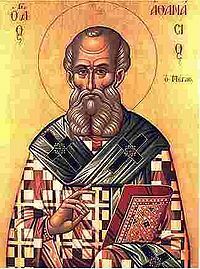 Please indulge with me each Tuesday, as we cozy up at the feet of Uncle Athanasius. Why did Jesus have to die publicly? Have no fears then. Now that the common Savior of all has died on our behalf, we who believe in Christ no longer die, as men died aforetime, in fulfillment of the threat of the law. That condemnation has come to an end; and now that, by the grace of the resurrection, corruption has been banished and done away, we are loosed from our mortal bodies in God’s good time for each, so that we may obtain thereby a better resurrection. But look at this argument closely, and see how merely human it is, whereas what the Savior did was truly divine and worthy of His Godhead for several reasons. The first is this. The death of men under ordinary circumstances is the result of their natural weakness. They are essentially impermanent, so after a time they fall ill and when worn out they die. But the Lord is not like that. He is not weak, He is the Power of God and Word of God and Very Life Itself. If He had died quietly in His bed like other men it would have looked as if He did so in accordance with His nature, and as though He was indeed no more than other men. But because He was Himself Word and Life and Power His body was made strong, and because the death had to be accomplished, He took the occasion of perfecting His sacrifice not from Himself, but from others. How could He fall sick, Who had healed others? Or how could that body weaken and fail by means of which others are made strong? Here, again, you may say, “Why did He not prevent death, as He did sickness?” Because it was precisely in order to be able to die that He had taken a body, and to prevent the death would have been to impede the resurrection. And as to the unsuitability of sickness for His body, as arguing weakness, you may say, “Did He then not hunger?” Yes, He hungered, because that was the property of His body, but He did not die of hunger because He Whose body hungered was the Lord. Similarly, though He died to ransom all, He did not see corruption. His body rose in perfect soundness, for it was the body of none other than the Life Himself. Athanasius, On the Incarnation, chap. 4, sec. 21, http://www.ccel.org.